If you were looking for a site, which can offer you new templates on a regular basis, and which is in Greek, look no further! 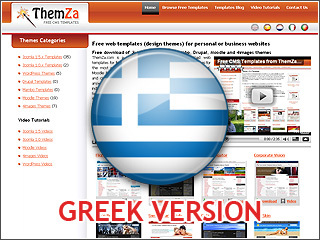 Our website ThemZa.com is now translated into Greek in its entirety, starting from the detailed video tutorials section “Βίντεο μαθήματα”, our “Design blog” section and, most importantly, our “Δωρεάν πρότυπα” free template section. The exact URL for the Greek version of our website is http://www.themza.com/gr/. If you prefer to see just the templates pertaining to a specific script, you can use our template categories on the left. From there you will be able to access the templates for the Joomla 1.0, Joomla 1.5, WordPress, Moodle and 4images scripts. Each template is presented via a detailed article where you can find all about the features it is offering as well as information on how to modify them. There you will also find related video tutorials, which can further assist you in installing and modifying the given template. This entry was posted on Tuesday, December 1st, 2009 at 1:56 am	and is filed under General updates. You can follow any responses to this entry through the RSS 2.0 feed. You can leave a response, or trackback from your own site.